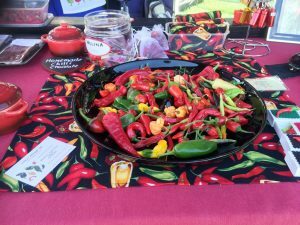 The Cheese and Chilli Festival is the only show in the UK which celebrates both Cheese and Chilli within a festival setting. The event is organised by 33rd Management Ltd who created the first event in 2014. The events are aimed towards the family audience as there is simply something for everyone. Each event accommodates approximately 5,000 visitors over each weekend. There are approximately 70 traders at each show along with a children’s play zone accommodating shows such as Punch and Judy, a Magician, Falconry displays, children fun rides and inflatables etc. If that is not enough, there is live music, demonstration/talks, a chilli sauce competition which customers judge and a bar offering supplied by local breweries. The stars of the Cheese and Chilli Festival are the traders and we have some of the UK’s best producers at the shows. The event will bring an amazing array of tastes, colours and experiences to town and is a ‘must go to event’. Visit the Cheese and Chilli Festival website now!